This article is dedicated to all those scuba diving enthusiasts who ready to take their first plunge. Also, folks who are already very much into free diving and keen on buying brand new equipment, here I present reviews of the best scuba diving gear packages. How and when purchase a scuba diving gear package? The advantages buying of scuba diving gear package. Other Accessories like dive lights, trolley bags, etc. Reviews of the best scuba diving gear packages. How and When to Buy a Scuba Diving Gear Package? Having the right scuba diving gears is of the paramount importance while scuba diving. I mean that’s the most obvious fact, right? 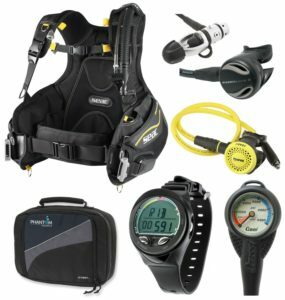 Note that most gear package deals include items like BCDs, regulators, computers, dive lights and accessories like this. For essential gears like wetsuit and mask, you either have to buy them separately or use the ones provided by your diving training center. If you’re not sure whether you should rent the gears or buy a package, here’s my thought. You should try with rented gears first if you’re just a beginner and not sure whether you’ll be continuing to dive or not. Investing in brand new gears will be a total waste of money in that case. On the other hand, if you’re a die-hard diving fan like me and take the plunge quite often, your ultimate choice is to buy your own gear, isn’t it? Since masks and fins are not included in such packages, I would recommend you to buy them before buying the gear package. Make sure that the mask and fins are suitable for both snorkeling and scuba diving. Some people make the mistake of choosing masks and fins that are only suitable for snorkeling. The ideal type of fins for scuba diving is open-heel and not very long. And as for the mask, look for a low-volume mask for a better fit and visibility. You will be much better at your activity when you’re familiar with the gears you’ll be using. However, if you’re a germophobic like me or highly hygiene conscious, putting a regulator which has been used by God-knows-how-many people before you in your mouth would be a big no-no. Even if you ignore that bit, what is the guarantee that the rented life support system will work properly? What if it’s defective? When it comes to life and death situations, I don’t think anyone should take any risk. I was talking about familiarity with your gears. Yes, that’s another important point to consider. You will find it much easier to adjust the regulator, SPG or the computer if you’ve used it before. Although almost all the models operate in the same way, it still takes a while to get used to maneuvering machines we are using for the first time. What if the right size and desired model of BCD or mask or fins isn’t available at any rental shop when you visit abroad? This can happen, right? Especially during holidays, all the exotic beaches are overcrowded, and it’s super tough to find suitable gears, even if you’re willing to shell out extra bucks. Last but not the least, you will have to be super careful with rented gears. The rental stores will charge a penalty if they find the slightest distortion in any gear. Do you want to enjoy your diving or babysit your scuba gears, bro? You have to make sure that the mask properly fits your face. To check the fitting, once wear the mask without attaching thee strap and once while placing the regulator in your mouth. You should be able to reach the nose pockets easily while doing the latter. If it sits comfortably on your face, leaving no gaps, you’ve found the right mask. Once again, it’s all about proper fitting. Don’t buy a wetsuit that is too tight as it will restrict your movements. Foam neoprene rubber is the most common material used in making wetsuits. The thickness and type of material ideal for you will solely depend on the diving environment. The basic job of a regulator is to convert high air pressure in the tank into ambient pressure. Some top-notch regulators come equipped with diver controlled knobs to let you adjust the air depth easily. Try out a couple of mouthpieces to before buying to make sure you don’t feel uncomfortable while keeping it in your mouth. BCD has an inflatable bladder that lets you maintain a neutral buoyancy at any given depth of the water. Apart from the adjustments and fittings, you should make it a point to get all the valves checked by an expert. Dive computers monitors display information like ascent rate, no-decompression time, depth of water and much more. No matter how expensive or feature-packed the gear is, you need to make sure the controls are easy to operate. 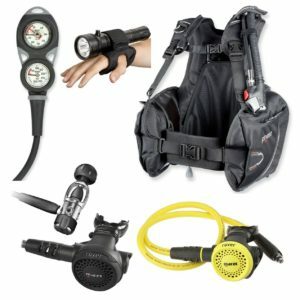 This scuba diving kit consists of some exciting gizmos that can make your scuba diving experience memorable. The BCD in this package is an upgraded version of the old Mares BCD. The classic jacket style BCD along with a solid backpack is flawless. It’s solid and comes with strong handles. The Rover 12 regulator incorporates Tri-Material Valve Technology to aid natural breathing underwater. The DFC system helps in reducing the intermediate pressure drop in the first stage to optimize performance and stability. The display of the diving computer has a brilliant display which is a huge plus-point. It is built from a shock-resistant material, so you don’t really have to worry about it getting damaged easily. 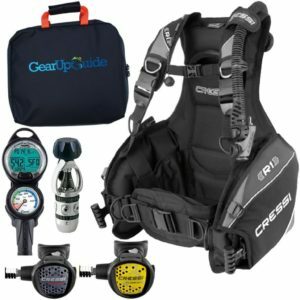 Cressi is a leading brand, known for manufacturing some of the best scuba diving, snorkeling and spearfishing gears in the current market. The BCD in this set is as rigid and user-friendly as it gets. It has got several pockets including a couple of removable weight pockets. The AC2 regulator in the package is extremely dependable. It is essentially a non-balanced Flow-by Piston designed regulator which makes it an excellent choice for new divers. The Leonardo Console is innovative in terms of both technology and design. I was pleasantly surprised by its feather-light weight. 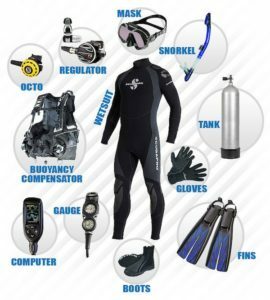 All in all, if you’re on a budget and at the same time, bitten by the scuba diving bug, this could be your go-to gear package. Having said that, technical divers will not find some necessary equipment in this package so, that might be a turn-off for them. 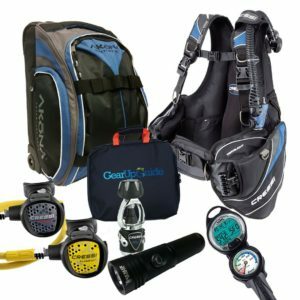 This scuba diving kit from another acknowledged manufacturer is easy on the pocket and comprises of all the necessary features you’d need for your first diving trip. In the package, you’ll find a weight-integrated BCD which performs exactly as advertised. It maximizes buoyancy at any depth. The outer and inner breathing bag materials are added perks. Like any reliable scuba gear kit, this one is also suitable for people of almost all sizes. The digital dive computer has to be the best feature of the lot. The controls are easy to operate, and the output could be easily deciphered by newbies as well. Do pair it with the right wetsuit, mask, and fins and you’re least likely to face any problem with it. Cressi Travelight is a small package filled with goodness. It is probably the ideal bet for first-timers. The regulator set BCD MC9, and Octo Leonardo Console are made from highly durable, shock-proof materials yet they are surprisingly lightweight. The BCD has ample rings so I could carry all the necessary items I wanted with me while free diving. Another perk you’d love is that the hoses come fully assembled. The BCD has two straps for the tank, as expected from any top-quality scuba gear set. I won’t recommend this to a technical diver or a veteran. If you’re not sure whether diving is your cup of tea or not yet, start off your journey with this set, and you might just end up thanking me later. 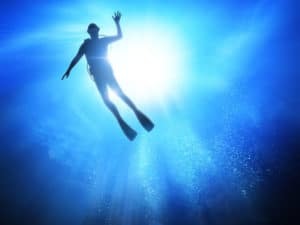 What are the best scuba diving lights? Looking for the best underwater fishing camera?